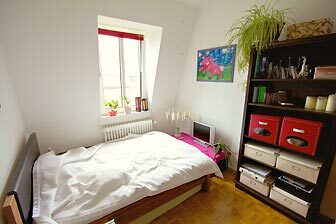 The guest room is located in the Rotlintstraße in 60312 Frankfurt am Main, Germany. or: stadtplan der Stadt Frankfurt. The apartment lies on the 4th upper floor of a traditional old-style building (without a lift) in Rotlintstraße, right at the centre of Nordend – one of the oldest parts of Frankfurt. Centrally located, it is just a 15 min. walk to the city centre and within 500 m are various bars, pubs and restaurants. Berger Straße, the heart of the city centre, is a 5 min. walk away and most suitable for a night out or for shopping. Friedberger Platz transforms into the most popular wine market of Frankfurt on a Friday and lies at the end of the street. Despite the central location, the area has small, quiet roads and parks where one can enjoy some peace and quiet away from the traffic disruption. A few metres away from the apartment is the Straßenbahn (tram) and bus station; the U-Bahn-Station Merianplatz is an 8 min. walk away. The bus travels directly to the Exhibition Centre Frankfurt, the S-Bahn arrives at Konstablerwache in 4 mins where all S-Bahn lines and some U-Bahn lines cross. The apartment is 100 m² in size and has 4 rooms, of which 1 is used by the guests. The non-smoking room is 14 m² in size, with a 1,4m wide bed, a TV and a PowerMac with internet connection. The windows have shutters to darken the room. 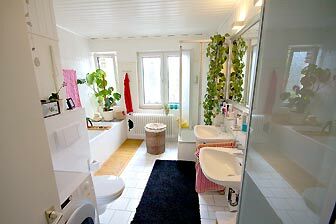 The kitchen and spacious bathroom are shared with the host. If requested, the washing machine can be used at a charge. Children under 3 can stay for free in a brought bed or in the bed of the parents. We regret that pets are not allowed. There is parking directly in front of the apartment, but the spaces can be rare during the evenings. Both hosts are happy to be living in Frankfurt, work a lot and are seldom at home. They look forward to greeting new and interesting people in their very comfortable apartment. They love this area of Nordend, often go out there and will gladly share their thoughts and tips about the various bars and pubs. 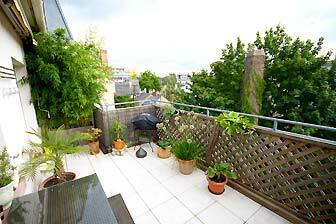 The hosts smoke occasionally, so a cigarette can be smoked in the kitchen or on the terrace. But even smokers will appreciate that this is not a chain-smokers’ apartment. Please do not smoke in the guest room. The hosts speak English and French … not very good, but gladly. Breakfast is not offered, but of course, the kitchen can be used for preparing breakfast and there really are plenty of shops and breakfast cafes (from 7:00 am) in front of the door. For your booking a deposit of at least 25 % is necessary, the complete payment at arriving only is possible for short-term bookings. spam protection: 1 + .3 = <- Please enter the sum. 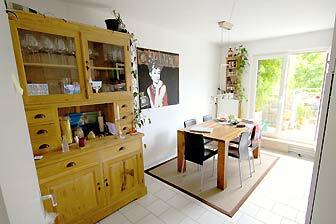 This private room is made available by Privatzimmer Sens, Agency for holiday apartments and guest rooms in Germany. 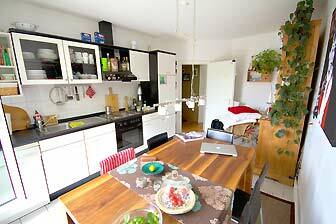 We wish to thank the Bed and Breakfast Ring Germany for listing this accommodation. We have taken great care with our translations. Translation errors can nevertheless occur. In the case of discrepancies between this translation and the original German version, the German version is valid.